First, let’s get the terminology issue out of the way — although the title is a wonderful attention-grabber, Frank Schaeffer is not an atheist by any common definition of the word. I’d say he’s a very liberal Christian who attends an Orthodox church because he likes the liturgy, despite not believing in all the tenets of Orthodoxy. He’s certainly an agnostic in the sense that (I believe) every truly intellectually honest person is an agnostic — admitting that we cannot know for certain whether or not any god or gods exist — but on the whole, his praxis comes down on the side of tentative belief. He prays, even when he’s not sure who’s listening. It’s worth noting that in the Afterword he thanks Samir Salmanovic, whose book It’s Really All About God: Reflections of a Muslim Atheist Jewish Christian plays with religious descriptors in a similar way. Clearly, the two writers share the same approach: grab the reader’s attention with your title and get them thinking about what words like “atheist,” “Christian” and “belief” really mean. I think the key to Schaeffer’s ambiguity about belief and unbelief is found in his subtitle: How to Give Love, Create Beauty and Find Peace. The book, which unfolds partly as a memoir, partly as a collection of reflections on life and spirituality, argues — insofar as it makes an argument at all — that belief or unbelief don’t matter that much. If belief in God helps you give love, create beauty, and find peace, then that’s great. If your faith works against those things — as Schaeffer would probably argue that much of the evangelical world in which he grew up did — then it’s better abandoned. Relationships, art, moments of transcendence and joy — those are the things that matter, not what church you go to or whether you go at all. Schaeffer is by no means a theologian and this book is not a book of either theology or a-theology — it’s a collection of thoughts, stories and impressions rather than a coherent argument for a proposition. This is sometimes frustrating — for example, Schaeffer draws a very clear line between following Jesus, whom he sees as loving, forgiving and accepting, versus following the Bible, a book he condemns as being mainly harsh and vindictive. But of course this entirely elides an important question: how do we know that Jesus is loving, forgiving and accepting — indeed, how do we know anything about Jesus at all — if we reject the Bible? Why I Am an Atheist Who Believes in God does not exist to tackle those kinds of questions. 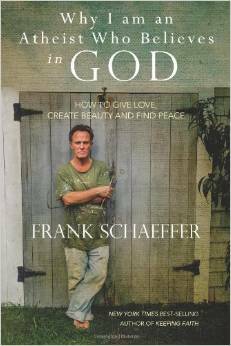 It exists as, perhaps, a series of postcards from Frank Schaeffer’s spiritual journey. If, like me, you read Schaeffer’s autobiography Crazy for God and were curious to know where the author landed spiritually after his turbulent journey from the home of one of the late twentieth century’s most famous evangelical preachers, to the secular life he now lives, then this book will answer your questions. If you are struggling yourself with how to balance your belief and your unbelief, a few thoughts from someone who’s walking along the same path — but who never claims to have any of the answers — may be helpful as well. I always feel that books with titles like “Jesus Feminist” (subtitle: “An invitation to revisit the Bible’s view of women”) are meant to be more attention-grabbing to people who, unlike me, don’t already believe that being feminist is completely congruent with being a Jesus-follower. To some extent, then, a book like this is “preaching to the choir” in the hands of a Christian feminist like me. However, it’s great to hear a variety of voices joining the conversation, and Sarah Bessey has a lot to contribute to this discussion. 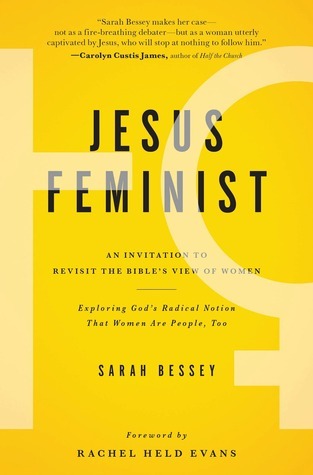 I’ve categorized the book as a memoir, and it is partly that: Bessey tells about her own experience growing up in a conservative evangelical setting, marrying, and encountering various attitudes to women and women’s ministries within the different churches she was part of, all of which helped shape her own adult views of Christianity and feminism. What I particularly enjoyed, apart from her warm and frank voice, is that she writes from the perspective of having grown up in and moved back to Canada (albeit with several formative young-adult years spent in American evangelical churches). Most of the progressive voices I hear coming from within the evangelical church tend to be American, so it’s good to hear someone from this country taking up some of these issues and sharing her experience. Bessey goes beyond just sharing her own life story, however, to explore many issues around women’s role in the church, with time spent analyzing Biblical texts in context. One refreshing addition to what was, to me, a familiar survey of the issues, is her insistence that any exploration of the role of women in ministry must be placed firmly in the context of service, and particularly of service with our sisters in the developing world. This is an important point, although in making it Bessey passes over some troubling issues, such as the fact that many of those same developing countries where the Christian faith is growing and vibrant, and Christian women play vital roles in evangelism, are also the countries where Christians are most likely to be implacably opposed to equal recognition of women’s gifts in ministry, particularly if that involves ordaining women to the ministry. This is an uncomfortable reality that all of us Western feminist Christians need to grapple with, and I’d like to have seen it touched on here. I would be really interested to see how this book resonates with a Christian reader who isn’t already convinced that women and men are equally “one in Christ Jesus” and in Christian ministry. Would Sarah Bessey’s experience and arguments be convincing to such a reader? I don’t know, but I did find this a worthwhile and enjoyable read.